GET YOUR BRAND OUT THERE, WHEREVER YOU GO.​. Vehicle Graphics are "Promotion in Motion." According to the American Trucking Association, 91% of individuals surveyed reported noticing and recalling the advertising messages on vehicles, 75% reported developing an impression of the company based on signage graphics, and 29% said they'd base a buying decision on these impressions. This is a great option for those looking to advertise using your window space and not losing visibility. This is a great option for vehicles but also a great for utilizing large retail stores fronts windows for advertising space. Our Window Clings are an exciting way to get your message across to many people at once. 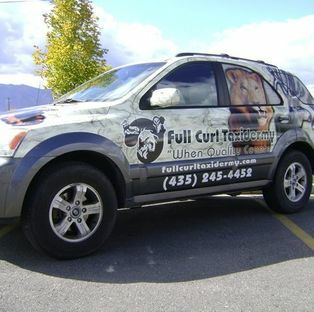 Whether you place your window graphic on your vehicle or store front, it's sure to attract attention. These window graphics are printed on a white, low-tac adhesive material, not static, making them durable and long-lasting until you are ready to remove them.